24th September 2017; the day we got married. 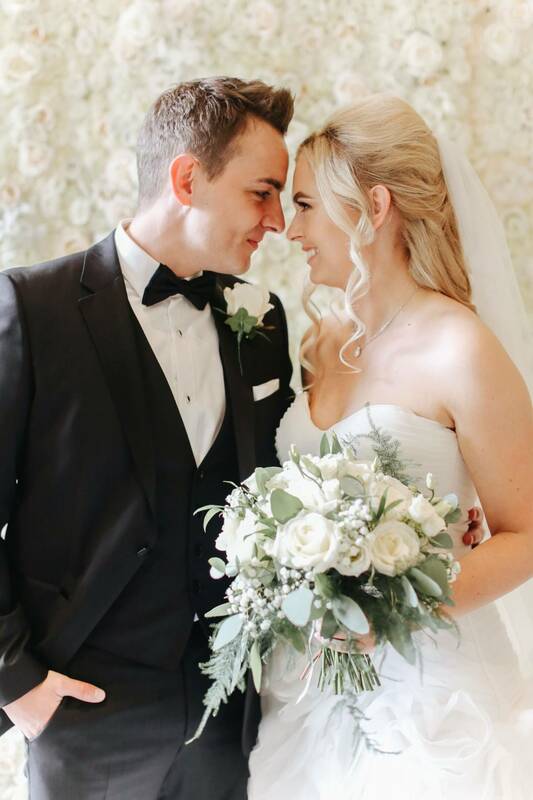 I’ve held off posting about our wedding day for a couple of reasons, 1 – we had 8 weeks to wait for our professional photographs, and 2 – we wanted to enjoy it for ourselves first. You can read our engagement story here. 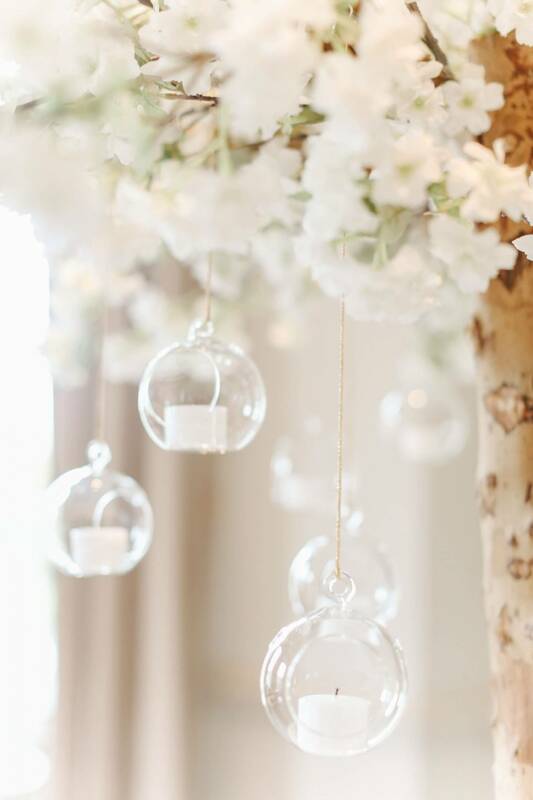 This post is all about styling our wedding so it is photograph heavy! I very much had a vision for how I wanted our wedding to look. This vision was white, timeless and elegant. We managed to achieve this by working with key suppliers, who were able to take our vision and turn it into reality. 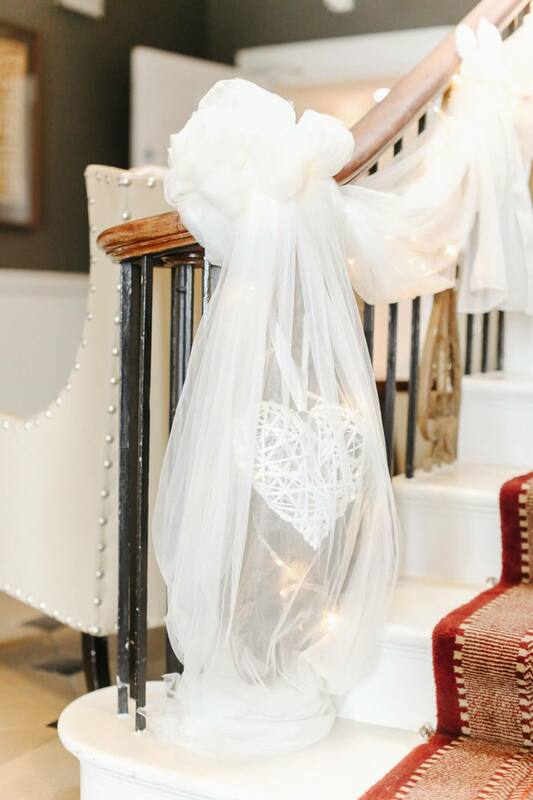 This post will focus on venue styling, the dresses will come in a future post! We visited several venues, all with beautiful grounds, but the odd garish green wall, or horrendous wood panelling, really spoiled it for us. 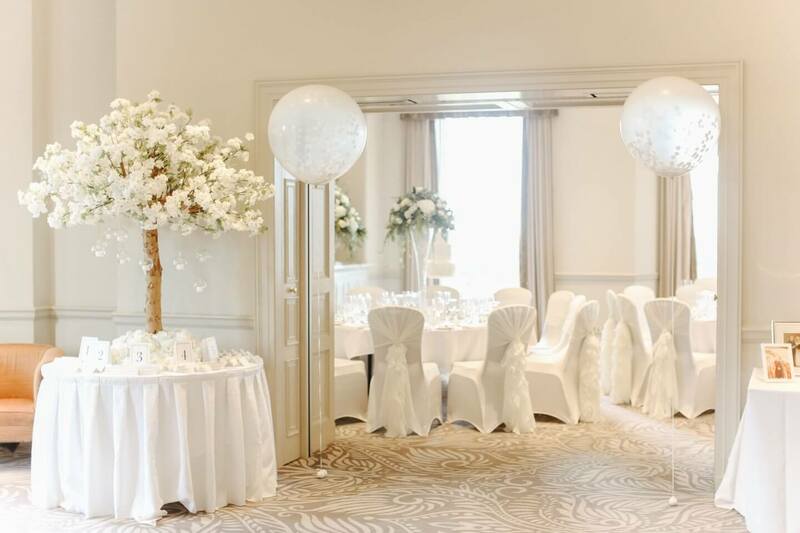 Our venue, Rudding Park, lent itself to this vision and allowed us to style our wedding exactly as we wanted. The grounds are stunning, as well as the reception rooms. Our ceremony took place in The Library, which is quite a dark room in Rudding Park. We decided on a white aisle carpet to brighten the space between our dressed chairs. At either end of the aisle we had acrylic boxes to display flowers. The acrylic meant no blocked vision, whilst providing height for the raised flowers we wanted. 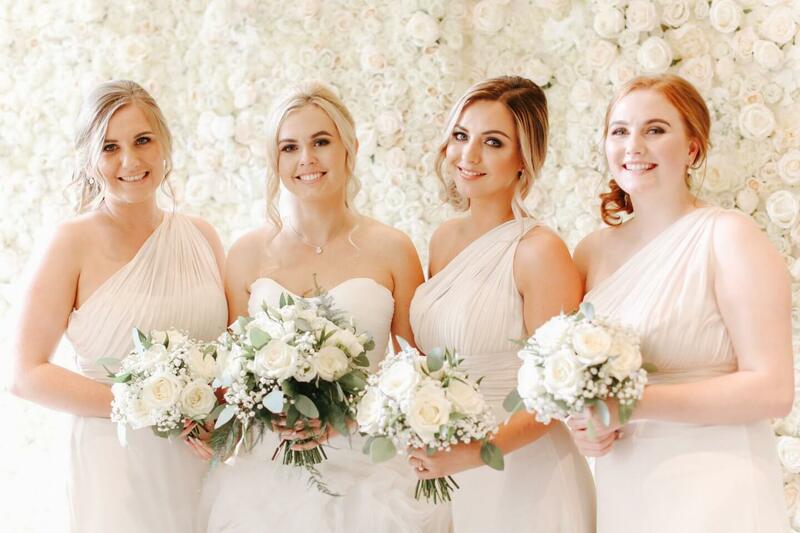 In the bar area we displayed our beautiful flower wall from Barnett Co. My bridesmaids and I headed straight to it for some selfies straight after the ceremony, but this really came into it’s own during the evening reception, as I wanted it to be used as a backdrop for guests to take photographs, which every guest did without prompt! 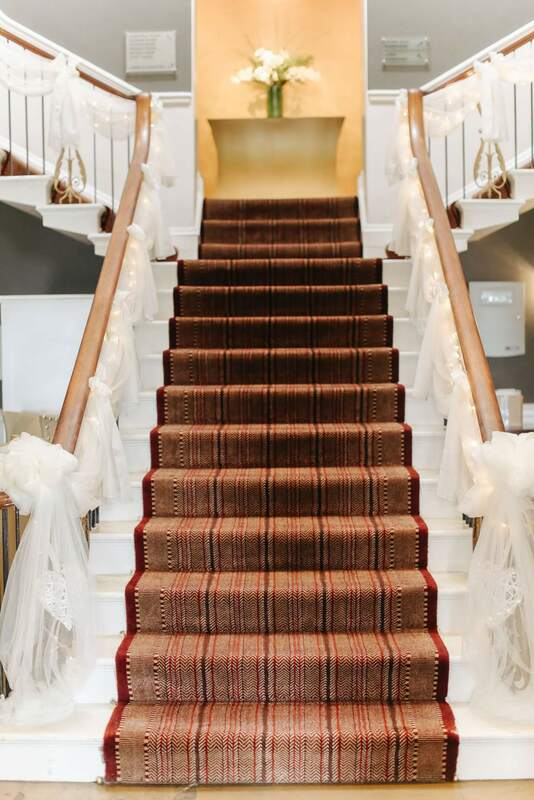 The staircase in Rudding Park was decorated by our florist (Flowers by Colette) and a digital sign board displayed pictures of Andrew and I over the years. Andrew designed the board and it was a nice personal touch to welcome our guests. Our table plan was an idea in my head which our venue stylists My Something Borrowed were able to bring to reality. 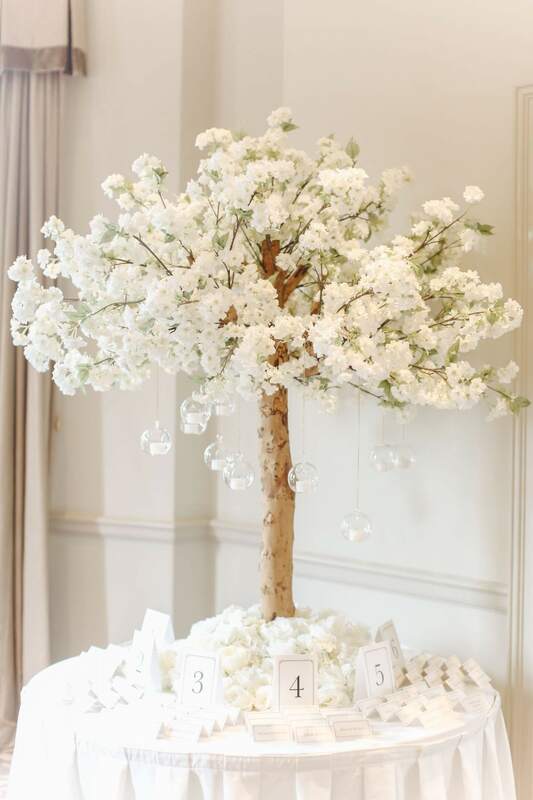 I wanted a white cherry tree with floating candles as the centre piece to the table plan, which would be laid out in printed cards. 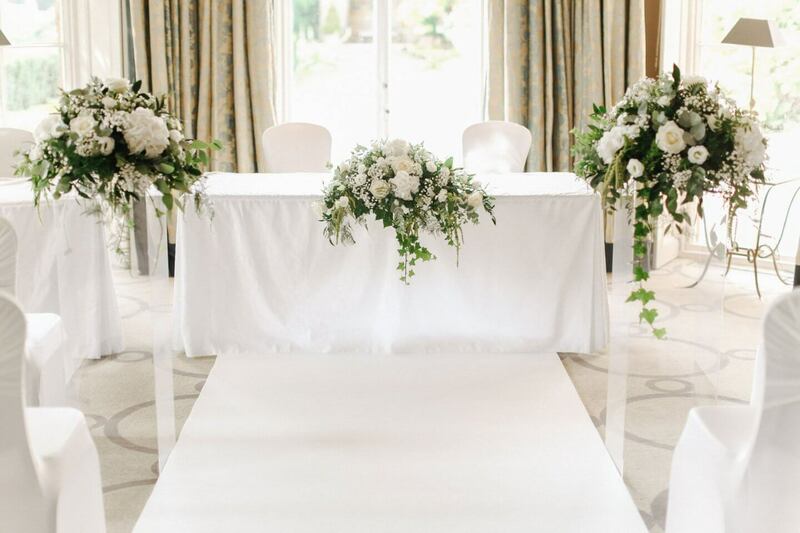 Each table had a floral centrepiece, made up of white roses, with cascading foliage and displayed in tall vases. I didn’t want anything fussy on the tables, but did want to encourage guests to speak to one and other. 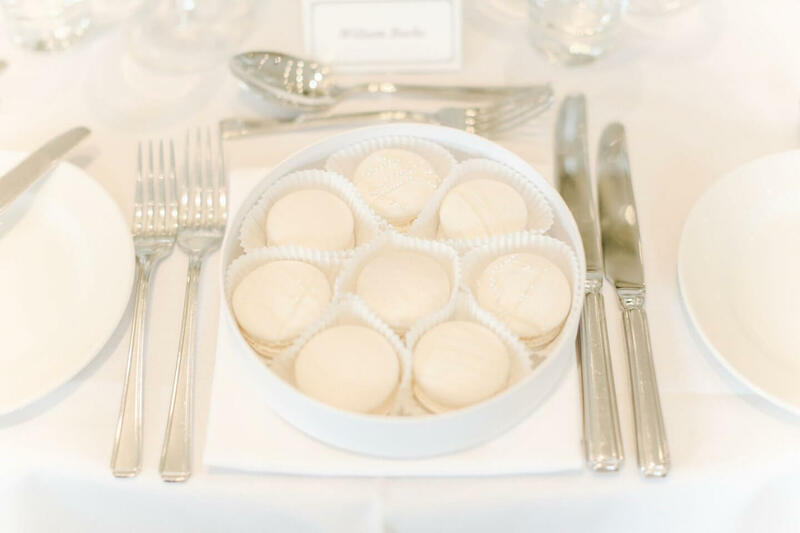 Andrew and I were able to achieve this by leaving a white selfie stick on each table, and having ‘sharing’ favours; a box of macarons for guests on the table. We also had flowers in urns which are a permanent fixture in the reception room. I didn’t want them left empty so we had these filled with white roses and hydrangeas. We added a couple of giant balloons between the room we’d be eating and where the party would be taking place. The balloons worked out to be quite expensive as it took one full bottle of helium to fill each. The balloons were then popped by guests after one too many, so pretty much a waste of money! A tapestry is also a permanent feature in the reception room we chose at Rudding Park. As this couldn’t be moved or changed, we had a white backdrop to cover it. 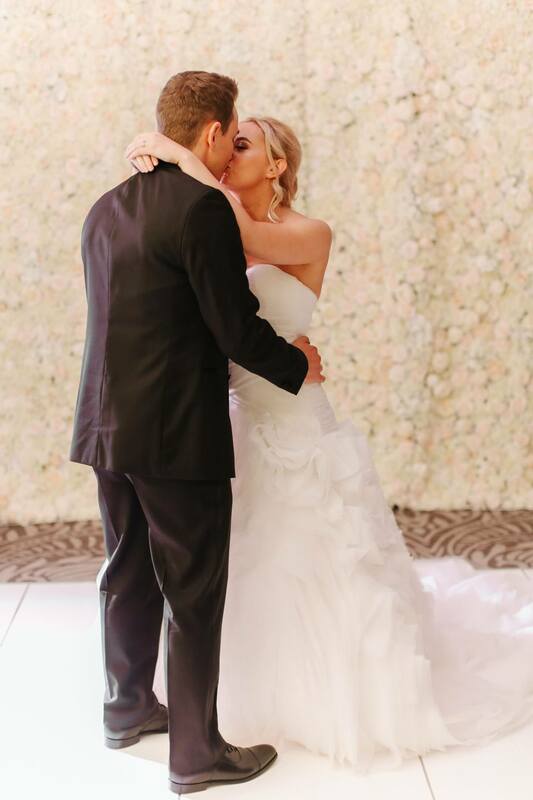 We also chose to hire a white dance floor instead of the wooden dance floor in the room. The flower wall was placed to the side of the dance floor and allowed for those much wanted photo opportunities to take place. If we were to do the day over, there is nothing regarding the styling of our wedding that I’d change. Spending time finding suppliers who can make your vision a reality is key. We used a lot of suppliers recommended by our venue, which had a multitude of benefits, mainly because they knew how it would look in situ. The flower wall was a big hit, and something I’ve not seen at any other weddings I’ve been to. I’d recommend doing something that hasn’t been done over and over again, which will make your day even more memorable. I’ll planning to write more wedding posts, if there is anything in particular you’d like to know, please leave me a comment and I’ll get to work. *Thank you to Barnett Co for supplying us with the flower wall for the day. This is so, so beautiful! 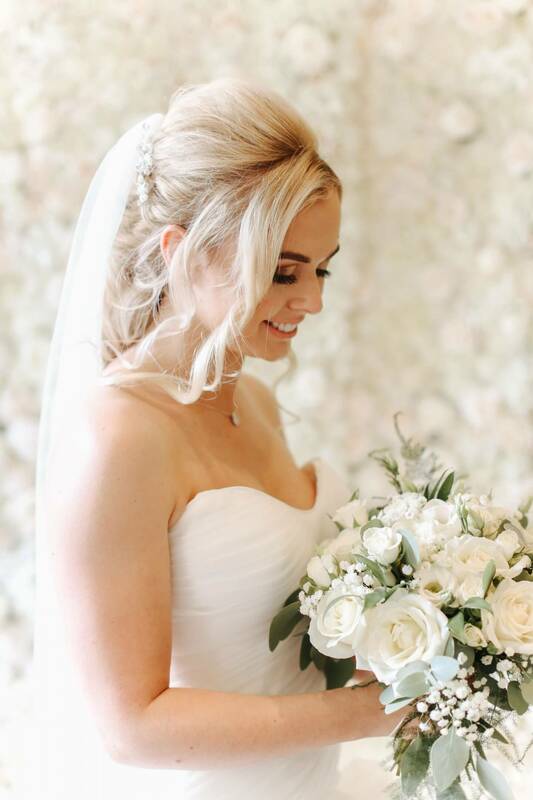 You definitely achieved the elegance that you wanted – it’s stunning, Lauren. ? Also, that flower wall is such a fab idea! Hope you had the best day. I’m getting married next Spring and loved the idea of a flower wall behind the head table! I’ve seen some great inspiration so I love seeing how everyone styles it! You looked absolutely beautiful as well!